Marilyn Monroe arrives at Great Fosters! A Surrey garden rarely seen. It's not often that Marilyn Monroe arrives to grace your front lawn! 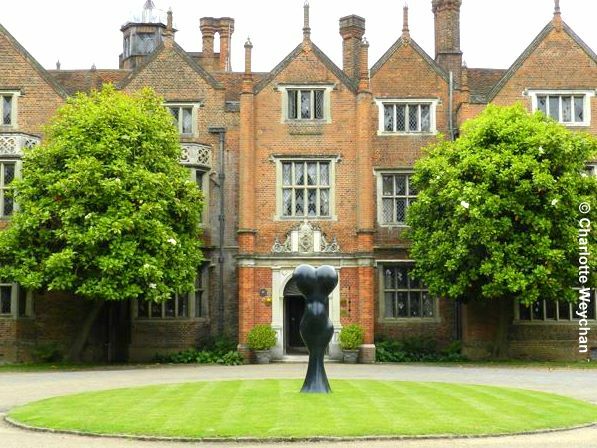 But she's arrived at Great Fosters (above) in Surrey as part of the Sculpture Al Fresco exhibition there from now until the end of August. 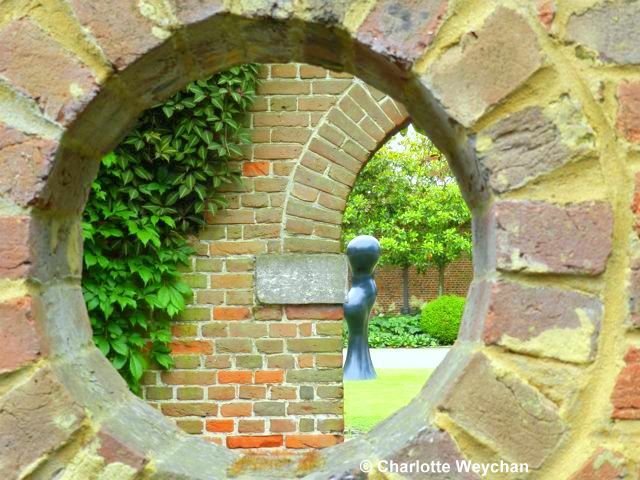 This is a great opportunity to see the garden at this luxury hotel in Surrey and admire the 14 sculptures on display. 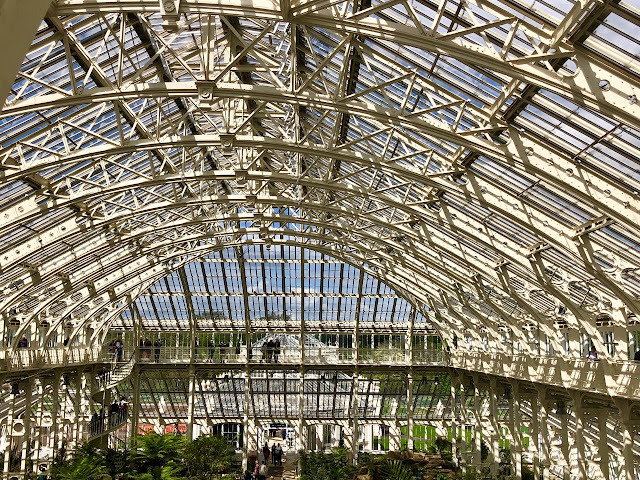 (I've been waiting for over a week for a sunny day to visit, so apologise if the pictures here fail to do justice to the garden and exhibition, which I viewed in between heavy rain showers!). 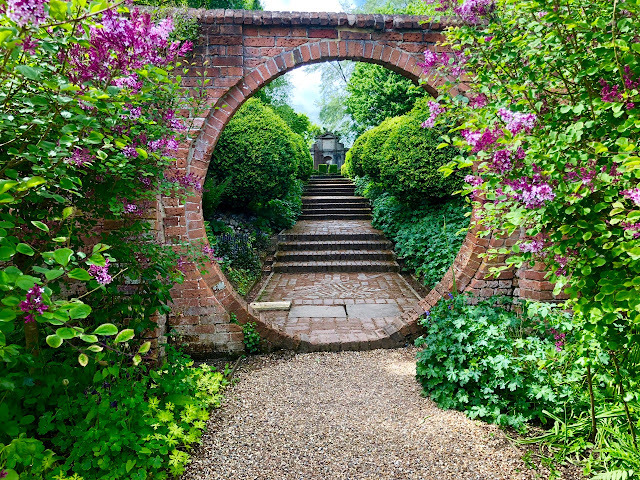 Great Fosters pioneered the concept of turning a country house into a hotel; has also maintained its historic Grade II* listed gardens and is now stepping into the world of garden sculpture. Quite an accolade for a property that nearly got cut off from the outside world by the intrusion of the M25 when it was built. So you won't be surprised to hear this garden here has been on my Wish List for some time. It's an interesting property - now a luxury hotel - but once a former hunting lodge, with a notable Arts and Crafts garden created in 1918, but recently restored by the current owners and sympathetically enhanced. 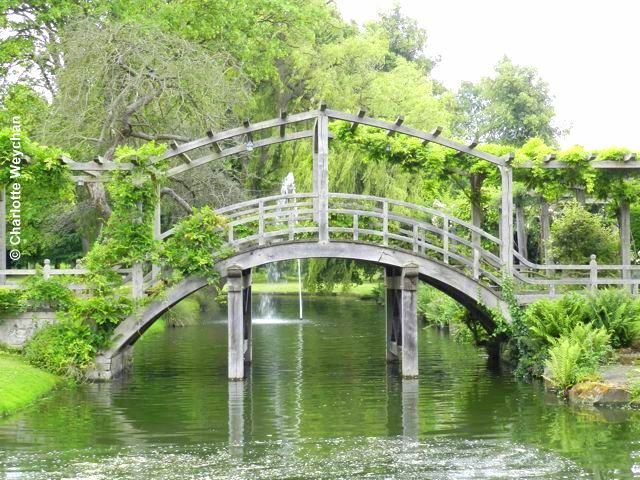 Close to the hotel, the garden is traditional, with a knot garden, pergola and sunken rose garden - all immaculately maintained and bounded on three sides by a moat that dates back to Saxon times. The landscape at Great Fosters incorporates lakes, wild areas and a fantastic amphitheatre designed and executed by Kim Wilkie. This feature is a stroke of genius, designed to "protect the property from the intrusion of the M25 motorway", and it's only when you get close enough to inspect it that you realise just what an eyesore and ear assault the road is. 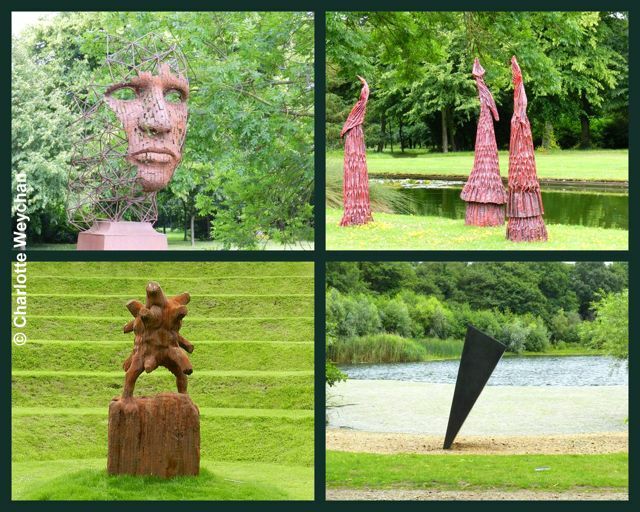 Sculpture al Fresco is a a collaboration between Great Fosters and Marcelle Joseph Projects, and is showcasing the work of nine sculptors: Richard Hudson, Rick Kirby, Carole Andrews, Richard Jackson, Emily Young, Nikolai Winter, Richard Trupp, Giles Kent and Alexander Yoda. It certainly works as a concept because there's another land at the hotel to give each exhibitor a personal space, and some of the finest new features of the garden are highlighted by the exhibits, like the amphitheatre, where Hoda's "Dancers" take centre stage. Parts of the building at Great Fosters date back to the 16th century, but it's been a hotel since 1927. The gardens adjacent to the house were refurbished just after WWI by W.H. Romaine-Walker, working in collaboration with G.H. Jenkins. 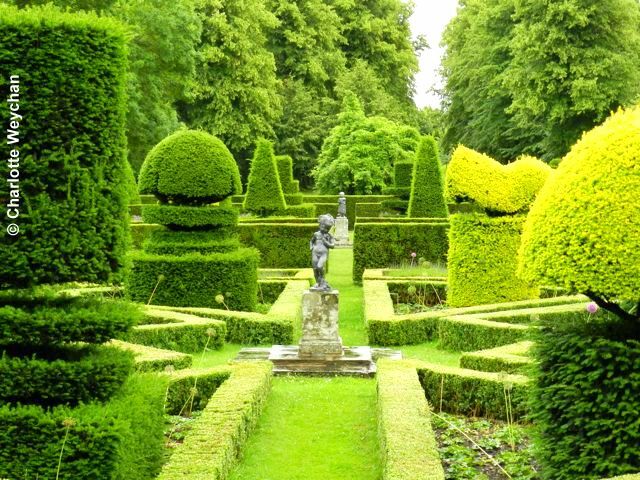 There's a fine courtyard area at the entrance to the property (currently graced by Miss Monroe), but it's the gardens at the rear of the property that will interest garden lovers, with the intricate knot gardens and topiary displays bounded by the moat. There's also the pergola (above) and modern interpretation of a Japanese bridge (below), which lead you to the double-lime avenue, which in turn leads to the spectacular amphitheatre. The result at Great Fosters is a pleasing relationship between ancient and modern. This is definitely a garden to savour, so do make the effort to get here while "Sculpture al Fresco" is showing. The exhibition is open daily 10.00 -18.00, until 28 August and there's no charge to view. If the weather's good, you can treat yourself to lunch in the garden! For real sculpture vultures, the Hannah Peschar Sculpture Garden is only a stone's throw away on the M25, although only open on Fridays and weekends (at other times by appointment). I'll be reviewing the new exhibition, which includes work by Richard Jackson, Rick Kirby and Emily Young, just as soon as I can get there! 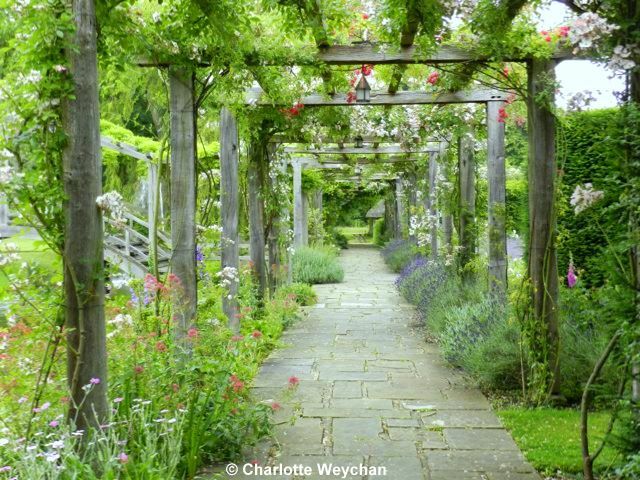 I would love to visit this garden one day, I have read about it before and think it looks really interesting. Your photos make me even more keen to see it - thanks. It would be fun to copy some other of the features you showed us, but alas, my pocketbook is not as full as that of Great Fosters. Thanks for the great tour of Great Fosters. I so enjoy reading your blog. Have you ever published any books?. I love the photos and your way of telling the stories of the places you have visited. Will be sure to look in from time to time. haha - I was anxious to see what 'Marilyn Monroe' looked like and when the pic came up, I had to laugh! 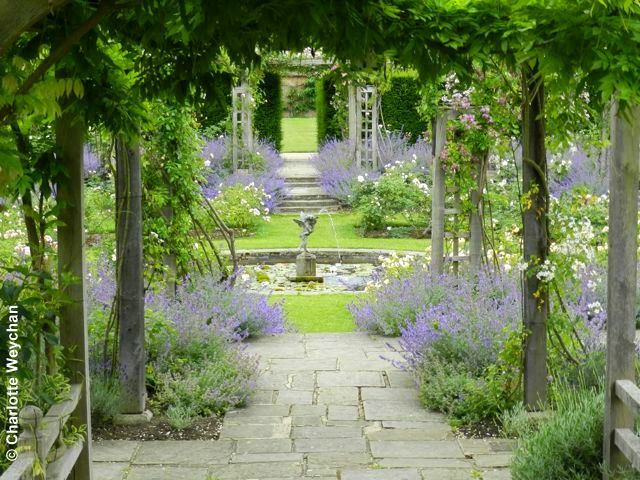 This garden is fabulous! Love the sunken rose garden. Is that catmint or lavender? Gorgeous! Interesting sculptures. I think sculptures add something to a garden and vice versa. The gardens are lovely! Thanks for the "virtual" tour. And here, I thought Marilyn Monroe was going to be a rose! I love sculpture in the garden. These are wonderful examples of combining the two. Wow - when I married my first husband 28 yrs ago, we stayed at Great Fosters on our wedding night! I remember touring the formal gardens immediately around the house, but we were off on our honeymoon that afternoon, so we didn't dally long.